This was the 36th Annual Appleton Car show and Swap Meet, held in beautiful Pierce Park which is right across the ravine from my house. Having lived here now for over 40 yrs, I've attended many of those shows. As in recent past years about 1100 cars attended this year. Attendance is free but the vehicle must be 1980 or older. 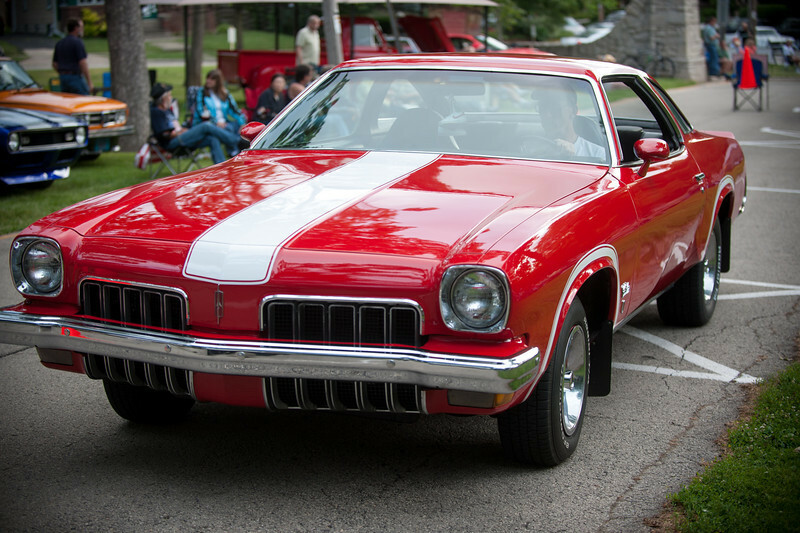 Though the show starts officially at 8 a.m., cars begin arriving as early as 6 a.m., often announced by their loud rumbles from glass pac mufflers (or no muffler at all–straight pipes). I went over about 7 a.m. and situated myself at the Park entrance where I could take photos as the parade of cars entered. Later in the day I did a walk-around to get a closer look at the cars. Unlike the past few years where it has been oppressively hot, this year it was cool and mostly cloudy, making tough lighting conditions for photography. Though not nearly as large as the famous Iola Car Show which is always the previous week, there is untold hours of loving care and dollar investment represented at this meet. And the crowd this year was quite large. I always have a good time here, especially since it's so convenient for me to attend.